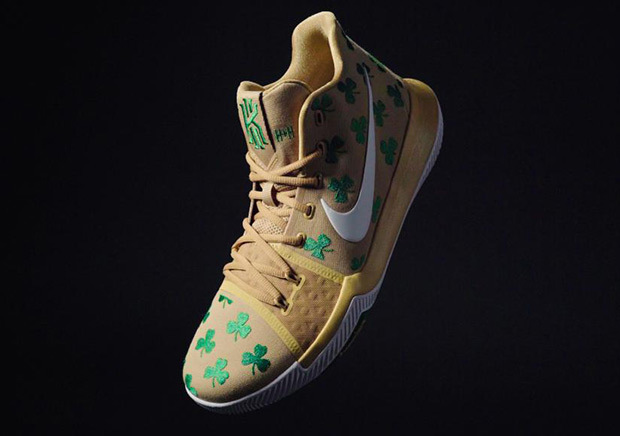 Nike has finally cemented the Kyrie 3 signature shoe into the Boston era as a limited edition “Luck” PE is set to release in limited quantity at two House of Hoops locations. Releasing tomorrow at House of Hoops Harlem in NYC and Washington st. in Boston, this Kyrie 3 features a tan base with an “all-over print” style application of green shamrocks. You’ll certainly need luck on your side if you’re looking to add these to your Kyrie 3 collection, so peep the preview photos here and grab these tomorrow only at the two aforementioned stores. Big Game. Big Stage. Big Luck. ☘️ The @NikeBasketball Kyrie 3 “Luck” Player Edition drops exclusively tomorrow (11/17) only at #HouseOfHoops Harlem (NY) and Washington St (Boston).